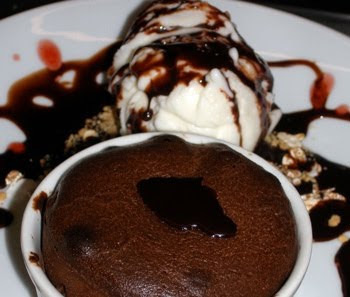 BACK IN THE 70's when I had my first restaurant, one of the desserts we served at lunch was a hot fudge sundae. We never wrote down the recipe because the delicious hot fudge sauce recipe was printed on the Fry's cocoa box. Eventually, Fry's changed the cocoa recipes on the box, and so the other day when I looked it wasn't there. I'm testing some ice cream recipes these days, and I wanted that hot fudge sauce recipe, so I went online, and I checked all my cookbooks, but none of the recipes resembled that one, whose ingredients were simply cocoa, sugar, water, butter and vanilla – that much I did remember. I occurred to me to write the manufacturer and request that recipe, along with the one for chocolate syrup that also appeared on the box, back then, and Cadbury's answer came today. And there they were! Serve over ice cream, preferably combined with marshmallow sauce for a divine hot fudge and marshmallow sundae, one of the world's great culinary inventions! Combine sugar and cocoa in medium saucepan. Stir in water. Cook and stir over medium heat until mixture comes to a boil. Reduce heat and boil gently 5 minutes. Remove from heat. Stir in butter and vanilla. Cool. Makes about 2 2/3 cups. Variation: To each cup of cooked sauce stir in 2 TB of your favourite liqueur. Microwave Method: Combine sugar and cocoa in 4-quart microwave-safe bowl. Stir in water. Microwave, uncovered, at HIGH (100%) 4 ½ to 5 minutes or until mixture comes to a boil. Stir 3 times while cooking. Microwave, uncovered, at MEDIUM (50%) 3 to 4 minutes longer. Stir twice while cooking. Stir in butter and vanilla. Cool. Gina's Comment: If the butter was unsalted, I would add a good pinch of salt, maybe as much as 1/4 teaspoon. Keep lots of this versatile syrup on hand to use in hot and cold drinks and other desserts. It’s the homemade alternative to the bottled stuff from the supermarket - but oh so much more natural. Combine sugar and cocoa in large saucepan. Gradually stir in water. Cook and stir over medium heat until mixture comes to a boil. Reduce heat and boil gently 5 minutes; stir occasionally. Cool. Add vanilla. Cover and store in refrigerator. Makes about 3 ½ cups. Microwave Method: Combine sugar and cocoa in 4-qt microwave-safe bowl. Gradually stir in water. Microwave, uncovered, at HIGH (100%) 8 to 9 minutes or until mixture comes to a boil. Stir 3 times while cooking. Microwave, uncovered, at MEDIUM (50%) 4 to 5 minutes. Stir twice while cooking. Proceed as above. Storing: Transfer it to one of those plastic ketchup or mustard squeeze bottles. Serving: For cold or hot chocolate, just stir some into cold or hot milk until it's just the way you like it. Or use as a chocolate sauce over ice cream, pancakes, etc. Shake before using. Gina's Comment: Here too I would add about 1/4 teaspoon of salt. Blend 1 tablespoon cocoa powder with 2 tablespoons of sugar. Mix in 1 tablespoon of cold milk until you get a smooth paste. Stir in 1 cup (250 ml) of hot milk. Sprinkle with cinnamon or cocoa powder if desired. TIP: To get a nice foam on top, whisk in the hot milk or use an immersion blender instead of just stirring. Make it in exactly the same way as the hot chocolate. I like to add some ice cubes.